WonderHowTo is made up of niche communities called Worlds. If you've yet to join one (or create your own), get a taste below of what's going on in the community. Check in every Wednesday for a roundup of new activities and projects. Thanks to all of our active moderators and contributors from this past week: Christopher Voute, Mr. Unknown, Cerek Tunca, Rex Gordon, and Adrian Rossiter. As always, we would like to remind lurkers on site: WonderHowTo is a community effort, and the site belongs to all of you. The more knowledge we can pool together, the more we can learn from each other. With that said, join in. Write a tutorial. Post to a World. We are a curious bunch, and we want to see what you've got to share! Below, this week's highlights: Making electron spirographs with an old CRT television, relieving a painful jellyfish sting, picking deadbolt locks, chatting anonymously online, and more! 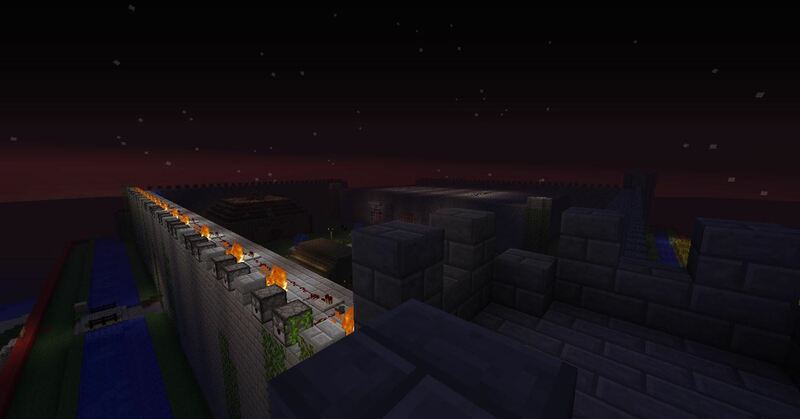 Minecraft World's Weekly Workshop — Have some in-game goodies to hide? Join our official Minecraft server this weekend for a step-by-step tutorial on building hidden passageways using piston doors and redstone. Make sure you're there on Saturday, February 11th at 2 PM (PST) / 5 PM (EST). More details here. If you still haven't joined the server, see how to get whitelisted. Minecraft World's Weekly Challenge — If you can't make the workshop, at least participate in the weekly server challenge! This week's theme is a continuation of "Buildings Throughout Time", focusing on Ancient Greece. Post your very best crafted Greek antiquities to Minecraft World's community corkboard for a chance to snag some server perks. More info here. Astronomical Observing News — Stay current on what's going on in the skies above with Cerek Tunca's weekly Astronomy World feature, AON. This week, make sure to snag a look at the comet Garradd while it's peaking. Click here for a full rundown of the stargazing events for February 7th through February 13th. And join the World to share your astrophilic knowledge. Community Byte — Both newbie and veteran programmers are welcome to join Null Byte's weekly community coding projects. Coding sessions instructed by Sol Gates take place every Monday and Wednesday at 5 PM (PST) / 8 PM (EST). HackThisSite missions instructed by Alex Long take place every Friday at the same time. This week's mission—hacking for animal rights activists. Meet up in the Null Byte IRC at the appropriate time! More details here. Weekend Homework — Looking for another way to get involved with Null Byte? Then check in every Friday for Alex Long's Weekend Homework. Know how to make moldable explosives? Can you hot-wire a car? Got the secret to hacking voicemail passwords? Then share your knowledge! Simply message Alex or post your article directly to Null Byte's community corkboard. Null Byte's Community Contest — Want to get your hands dirty with a custom-built program? Try out Null Byte's newest activity—a contest to see who can code the best hacking tool. Winner gets bragging rights. Program choices include a spider, email bomber, silent port scanner, and more. Winner will be announced next Wednesday, February 15th, so get coding! Details here. The beauty of jellyfish is unmistakable. So is their poisonous sting. If you've just brushed up against a jellyfish, Yumi of Secret Tips from the Yumiverse shows you the best way to relieve that irritation. And no… it does not include urine. Click to enlarge, or click through to view. Never have a secret communication intercepted by the enemy again! 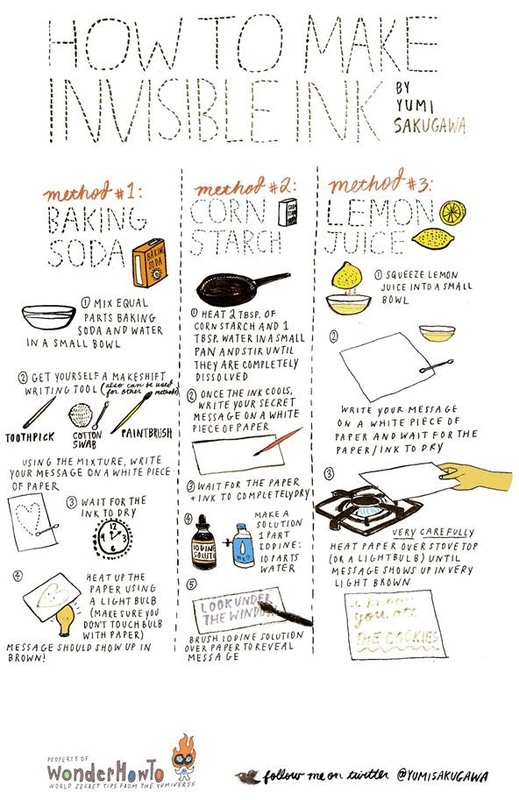 Below are three super easy recipes for making invisible ink to encode your messages, along with the decoding instructions. Click to enlarge, or click through to view. Christopher Voute charges up his Fear of Lightning World again this week with three electrifying projects. First up, he schools us on the theory behind EMP generators in the third part to his Making Electromagnetic Weapons series (also see parts 1 and 2). Then he shows us how to make a simple touch-triggered relay and some amazing electron spirographs using an old cathode ray tube, as seen below. And that's not all Christopher's been up to. He also gave all of us Null Byters the code for a handy IP change notifier program. 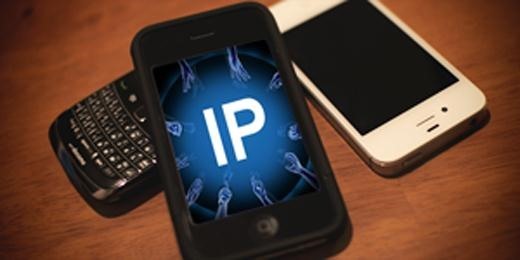 Made with Python, it can send you text messages whenever your IP address has changed. Check it out. Miss last Saturday's Minecraft Workshop on building suffocation traps? As a followup, Kendra W has put together a nice, detailed step-by-step article on something even better—an inescapable pitfall trap. Contact admin Kendra or mod Andrew Osborne if you're interested in co-instructing a future workshop or taking on a topic of your own. Mr. 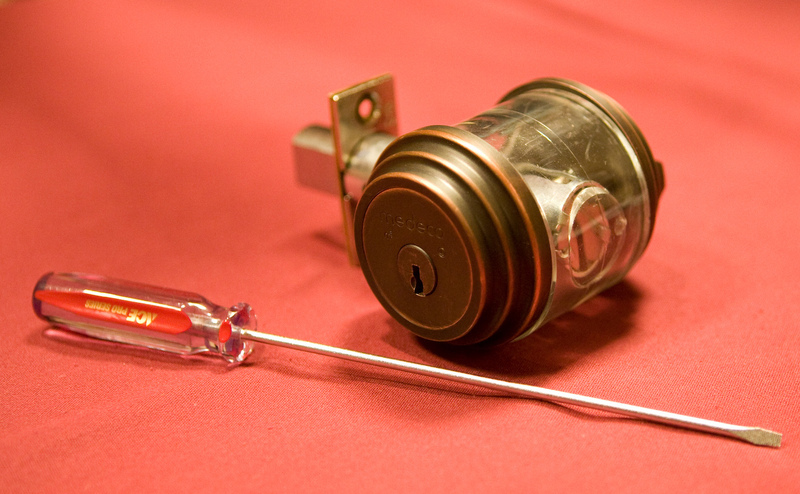 Unknown of Wire Storm Technologies always has your security in mind. His latest articles include keeping your Windows 7 desktop organized, securing your computer with Norton DNS, and chatting online anonymously using Cryptocat. Null Byte admin Alex Long is still blasting out the hacking tutorials. This past week he showed us the art of lock picking with padlock soda can shims and deadbolt picking techniques. Also, how to lock down your Android phone, getting free text messages for life, and more! Check out the blog roll for a full rundown. Are you interested in building old school robots? Then keep an eye on Rex Gordon and his Robot Realms World. He'll be detailing the entire process behind his ongoing robot build, Magnus, as well as teaching us a thing or two about drive systems and proper power requirements for your robots. Stay tuned for more. And feel free to ask any questions in the forum! Adrian Rossiter of antiprism.com posted a great link to Mario Marín's incredible polyhedra models and sculptures, which are constructed out of everyday items like compact discs, straws, egg cartons, etc. See more here. 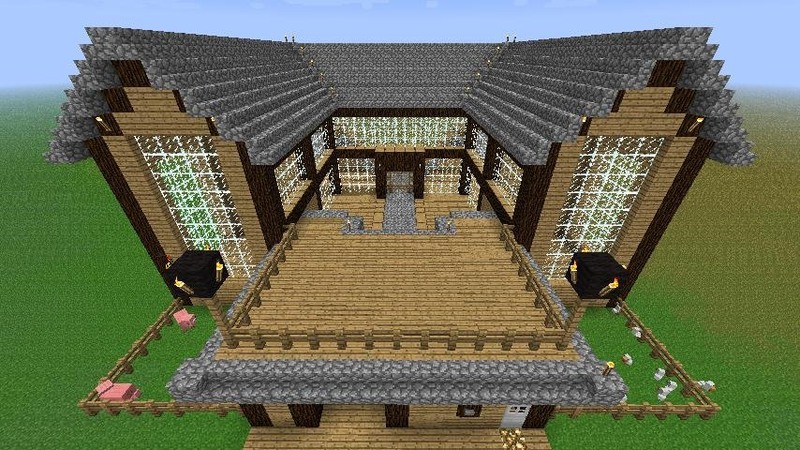 Everyone on the Minecraft server has been working hard and building some really cool stuff. There are too many projects to show off here, and below showcases just a few of the ones posted to Minecraft World's community corkboard. 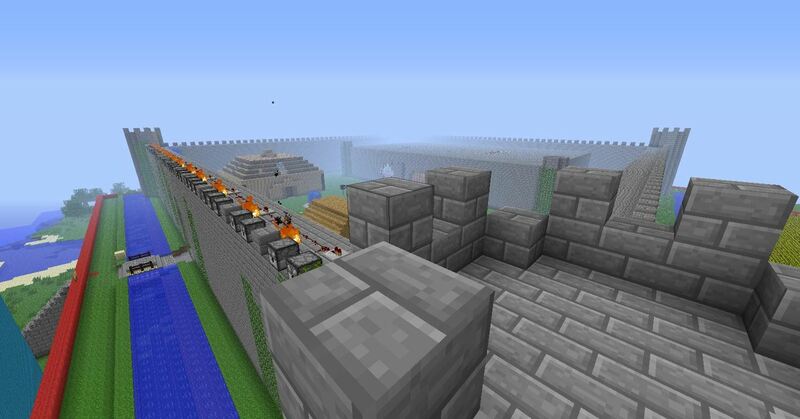 And don't forget to start erecting some Ancient Greek buildings for the Minecraft challenge this week.